If at first you don’t succeed… and all that. Back in February, 1948, we delved (deeply) into the concept of a tie-in concocted by record labels when it came to naming instrumentals in an effort to entice an important dee-jay in a key market to play your artist’s latest release, thereby giving the record exposure (often nightly, as it’d become the lead-in for their popular radio show) as well as sort of serving as a hearty muchas gracias to a figure whose role in publicizing your product in the future would often be the difference between having those records hit or having them miss. The record in question was Bouncing With Benson, the dee-jay it was named after was the popular Al Benson of Chicago, the label the disc came out on was Savoy and the artist who had absolutely no say whatsoever in this matter – for he’s just chattel in the big scheme of things anyway – was Paul Williams. Though popular in Benson’s territory it failed to elicit much interest elsewhere around the country, in large part due to the fact that other dee-jays are NOT named Al Benson and certainly don’t want to be promoting the competition, even if their radio station signals were far too distant to ever cross paths. But Herman Lubinsky, prexy of Savoy, was a stubborn fellow and instrumentals of course still needed titles, if only to give the printer something to earn his fee for when pressing up the labels to affix on those records, and so once more Paul Williams gets to see his next release adorned with somebody ELSE’S non de plume. Max Silverman, or Waxie Maxie as he was known, wasn’t quite in the same boat as Al Benson, or Jackson Lowe who’d had Joe Morris’s Lowe Groovin’ on Atlantic named in his honor back in March, or any number of other big wigs who saw themselves immortalized in song with the rash of instrumental records coming fast and furious over 1948. Silverman had started back in the 1930’s with a radio repair shop that soon expanded to sell records. His store in the heart of the black section of the nation’s capital naturally specialized in the music most appealing to this community, namely jazz, some blues and gospel, and eventually, when it began in 1947, rock ‘n’ roll as well. 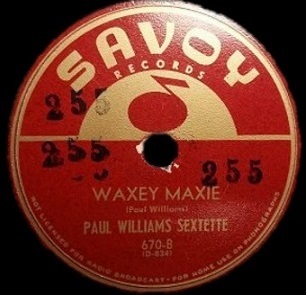 Back in the 1930’s a young Turkish diplomat’s son named Ahmet Ertgeun got much of his musical education by combing through the brittle used 78 RPM records that’d he’d buy from Waxie Maxie at three for a quarter. Later, when Ertegun wanted to first get into the record business himself and start a label he enlisted Silverman as a co-investor but the foray was a dud and Silverman pulled out quickly, leaving Ertegun to start Atlantic Records with money procured from his dentist instead. Silverman didn’t suffer much though, for like any good hustler he had his hand in multiple pots and soon started sponsoring a radio show to promote his store, exposing the records he sold there and boosting his own image as the man about town when it came to music in D.C. in the process. Ertegun had remained friendly with Silverman and in those early days of Atlantic relied on those records being spun on his show to at least give them a bit of exposure in one area of the country which, thanks to the spins, could be counted on to buy some copies and help keep the struggling label afloat. Paul Williams, guess what the name of your new record is going to be? I guess we can’t feel too sorry for any of the people involved in these sort of shenanigans, harmless as they ultimately were. Savoy used its most expendable asset (an otherwise meaningless title of an instrumental) to get some spins and generate some sales. Silverman’s sponsored show got to have his own theme song made by a fairly big name artist to boost his ego a little more. And Williams – the artist whose career is in part riding on all of this horse trading – presumably got a little more exposure in the process, at least in one region of the country. Did any of them get their money’s worth though? Well, I guess the answer to that is how you look at it. 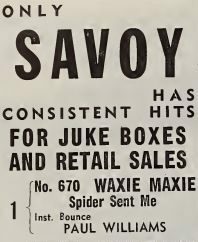 Waxie Maxie, the record not the entrepreneur himself (notice the spelling differences on the label itself – Waxey Maxie – and the ad – we’ll go with the latter, which is the way it’s been spelled ever since), is fairly mundane in its aspirations but pretty solid all around nonetheless. It’s built on a repetitive riff with a hard first note to draw attention to it before settling into a swinging progression that’s decently melodic and fairly memorable, but hardly spine tingling. They’ve started to hit upon the right formula at any rate by this stage of the game, backing off the polite daintiness that marred so many earlier efforts by bands who had come up in a slightly different era, and so by now they know enough to emphasize the rock-solid riff as the underpinning to the freestyle display the lead instrument plays over the top of it. They also seem to understand that at some point it needs a passage that’s a little more urgent and compelling to keep you on the dance floor, or at the very least grooving your shoulders to it as you listen on a jukebox or radio somewhere. Sure enough, right on cue during the second solo it digs deeper for its most exciting stretch, more of a bump and grind style striptease number, albeit a little faster than usual, as if the building was on fire and the patrons demanded their money’s worth before the place burned to the ground and so the stripper was peeling off clothes left and right as fast as she could to get every last dollar before she was burnt to a crisp… but I digress. Despite these relatively strong features though it’s more of a pastiche of the style than a leading exponent of it, for it really doesn’t build any suspense in the process. There’s no sense of anticipation or tension waiting to be resolved, no mounting excitement or curiosity as to where it was leading (we’re talking about the song again, in case your mind was drifting back to the stripper… shame on you!). But even though the record doesn’t lead anyplace it’s not without its charm. The riff itself is very intoxicating and will keep you grooving, maybe not paying too much attention to it since it never changes, but as long as you’re not ignoring it intentionally it’s doing what it set out to. The ending is particularly captivating, though it seems to be as much a trick of the mixing board as it is the arrangement, as the sound softens over the last twenty seconds or so as they keep churning out the same circular riff that started it and had acted as the anchor to the whole shebang throughout. Of course to be honest you’d certainly have to say it’s a step back from Williams’s last record, The Twister, which was riveting in its flamboyant intensity, not to mention falling short of the record that just came out by label mate Wild Bill Moore, We’re Gonna Rock, which featured Williams in a prominent supporting role. However, Waxie Maxie still works well enough for what it aspires to be, which is a fairly catchy backdrop for something else, be it a stripper (okay, okay, I thought I’d be nice and let your mind have one more glance at her… no need to thank me) or a radio show introduction. In the end both the stripper and Williams will walk off the stage leaving just a little too much to the imagination so those who stuck around will call for more drinks and await the next act, hoping for a bit more down and dirty action. Meanwhile the dee-jay on the show whose name this record adorns will invariably reach for something a bit more scintillating to spin next to ensure the listeners don’t switch the station before the first commercial break. Though admittedly this isn’t going to be the track of Williams’ you’ll necessarily reach for first, nor is it going to be setting the pace for the summer (or even just August for that matter, where every record we’re reviewing is a sax-led instrumental), it’s still better than average, a good song and performance that was completely in line with what else was happening in late summer of that year. But if you’re looking at it from the perceptive of those who stood to benefit from it financially at the time, Lubinsky, Williams and Silverman, that’s a different story entirely. Other than Williams (and he even he might be convinced otherwise) the main goal wasn’t necessarily musical bang for your buck as much as commercial clout for your cash and in that regard this naming rights giveaway sweepstakes finally paid off. The record charted, hitting #11 on Billboard‘s Race Charts, keeping Savoy’s bank account flush while also keeping Williams solidly in the mix of all this noise heading forward. As for Silverman, when he died in 1989 his chain of stores sold for just short of twelve million bucks. Somehow I don’t think Paul Williams, who was still going strong then at the age of 74, got a piece of that. Leave a reply on "Paul Williams: “Waxie Maxie”"